Husband and wife Clive and Margaret, along with Clive's son, Roger, and Margaret's daughter, Alison, have gone on holiday to a cottage in Wales. Working at the cottage are Huw, the caretaker whom everyone believes has gone mad, Nancy, the housekeeper, and Nancy's son, Gwyn, who develops a friendship with Alison. When Alison begins to hear scratching noises coming from the ceiling above her bed, both Roger and Gwyn are convinced it is rats. Gwyn climbs up to investigate, however, and he finds a curious set of dishes with an owl print. After learning of the plates, Alison begins to behave strangely: constantly drawing owls, crying out in her sleep, and experiencing lapses in her memory. In the meantime, Gwyn's mother becomes increasingly more distressed by the presence of the owls, as does Huw, who claims to have had firsthand experience with them in the past. It becomes clear, through conversations with both Nancy and Huw, that Gwyn, Roger, and Alison have been pulled into a tragic legend - the story of Lleu Llaw Gyffes and Blodeuwedd from The Mabinogion - the events of which repeat themselves in every new generation. The Owl Service is by far the strangest young adult novel I have ever read. From the very first page, there is a creepy, almost Gothic tone to the story, and though much of the book seems very realistic and ordinary, there is always an underlying sense of not quite knowing what is happening, and not being able to settle properly into the plot. Interestingly, despite being utterly confused by almost everything, the book's strong appeal made me want to keep reading, so that I finished the entire book in about two hours. What makes it so compelling, I think, is the realness of the characters, and the dynamics of their relationships: step-brother and step-sister, poor servant and rich vacationer, young men and young woman. It reminds me a lot of Madeleine L'Engle's books, in the sense that the relatability and authenticity of the characters is what drives the story, not necessarily the strange and unlikely events which happen to them. One thing I found especially refreshing in this book is that it does not explicitly identify the myth on which the story is based, and it offers no definitive explanation on how the book is to be read. Contemporary fantasy novels often include prologues which fill the reader in on where they are in time, space, and reality. With this novel, though, the ambiguity is part of the enjoyment of the book, and part of the reason to finish the story. The images used in the story are powerful, even when you don't fully understand them, and somehow it is the surrealism that makes the novel a true work of art. The Owl Service could be a frustrating book if it were assigned for school, but as pleasure reading, where the reader can just allow the story - and the British and Welsh slang - to wash over them, it is perfect. Middle school and high school readers who like mythology and fantasy might appreciate the challenge of a book like this, especially if they are bored with contemporary retellings of myths and legends. Though it might be a bit dated, The Owl Service is still in print, and available as both an ebook and an audiobook. 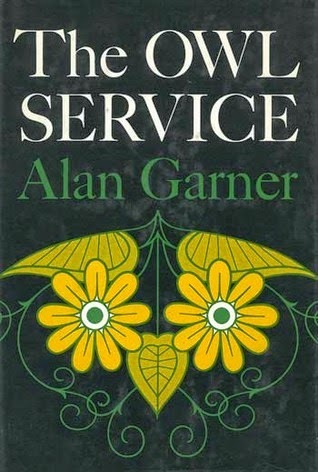 There is lots more information about the book, and author Alan Garner, at theowlservice.co.uk.